Scanned from a copy of Hart's Reminiscences of 1882 in the London Library, and formatted, with links to other material on this website, by Jacqueline Banerjee. Page numbers are given in square brackets. he first time I saw Maclise was at the Royal Academy, when the gold medal was presented to him, for his picture of the Choice of Hercules. On coming to London, Maclise had letters of introduction from Crofton Croker to Isaac Disraeli. Maclise told me that he became intimate with the Disraeli family. He used often to visit them at Bradenham, where he accompanied Benjamin Disraeli to the parish [100/101] church. As the two advanced in years the intimacy appears to have ceased. With his pencil portraits Maelise earned enough to bring his family from Cork, whom he maintained and educated. Two of his brothers he brought up as surgeons. One of them was Surgeon of the 90th Foot; the other illustrated Quain's Anatomy. 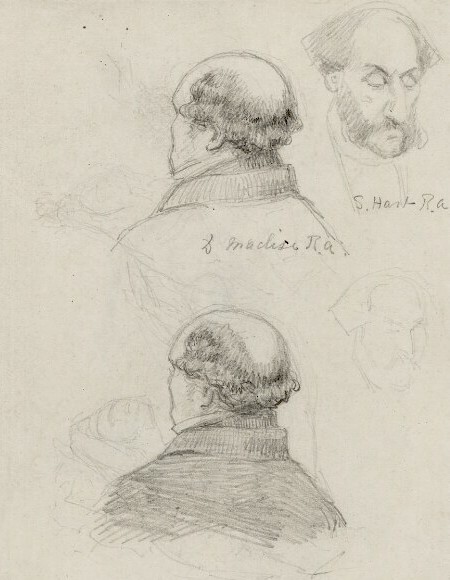 Pencil sketch of both Hart (top right) and Maclise by the sculptor Charles Birch, c. 1858, cropped to exclude a third head, © National Portrait Gallery, pencil, circa 1858 NPG 2476 (on the Creative Commons CC BY-NC-ND 3.0 licence). Sometimes Maclise felt a dislike to going into society. He confessed to me that one evening, having arrived at a door of a house in Eaton Square, where he was engaged to dine, he saw through the windows the bustle within. His heart so failed him, that he went on until he found a tavern, where he dined. The efflorescence which began to arise on the colossal work at Westminster — Waterloo — before even the Death of Nelson was commenced, very much de- pressed Maclise's spirits and tended to shorten his days. One day our conversation turning upon the City, he observed that he seldom visited it. When I remarked that he must know it well, as he went periodically to the Bank of England to receive his dividends, he replied, "Faith! 1 have no trouble there; Isabella manages all that." The individual named was his eldest sister. He was astonished when I told him, that the stock must there- fore be in his sister's name, and it was hers and not his. I referred him to his friend, John Forster, who conﬁrmed my statement. At his suggestion, Maclise went with his sister to the Bank, who transferred the stock into his name. He told me what he had done, and thanked me for my advice. For many years I know he did not keep a banking account. I have remonstrated with him for carrying in his pocket a roll of Bank-notes. Once, at a dinner-party, the conversation turned upon Archaeology as applied to the illustration of subjects out of English his- tory. The archaisms of the Bayeux Tapestry were discussed. I remarked to Maclise, that the theme being of national importance would afford great scope for a series of designs embodied in good art. When I congratulated him, upon the success of his drawing of the Norman Invasion, exhibited at Trafalgar Square, and afterwards published by the Art Union, he replied, "I am indebted to you for the suggestion." He reminded me of our conversation at the dinner-party, and said, "I did them in the winter evenings with a drawing-board on my knee, seated at my ﬁreside." Maclise was a very modest man. Although for many years I was very intimate with him, he never spoke of himself, nor of his affairs. When Sir Charles Eastlake died, I was requested by some of my brother Academicians, to tell Maclise it was their wish that he should become President. He asked what I thought of him, knowing him as I did, to suppose that such a post would have any charm for him, and observed that I [104/105] was as well aware as he was of his unﬁtness. "Am I an orator to ﬁll your chair with after-dinner addresses at your yearly banquet, or to deliver discourses? or am I a business man to preside over the deliberations of the general assemblies? Is it because I come from the sister island, whose inhabitants are accredited with powers of elocution, that I am supposed to possess them in common with tl1e rest of my countrymen, and on convivial occasions I might be carried away by the hilarity of the moment? You ought to know me well enough to be certain, that any title which would attach to the position has no inducement to me to withdraw from my studies, which I want to pursue, nor do I care to give the amount of time requisite for the fulﬁlment of the office." On the day on which Maclise was buried, Charles Dickens, at the Royal Academy dinner, made a funeral oration upon him. Moved thereby, I was induced, at the request of some of my brother artists, to ask Dickens to start, as chairman, a movement to show our regard for the memory of the deceased. He hesitated, but promised to consider the [105/106] proposal and let me have an answer, which, in due time, came in the negative. When I proposed, after Dickens's death, to Mr. O'Driscoll to print Dickens's letter at the end of his Life of Maclise, John Forster threatened to apply for an injunction. He contended that I had no power over the letter, and prohibited me making use of it, as it was the property of the executors of Charles Dickens. Hart, Solomon. Reminiscences of Solomon Hart. Ed. Alexander Brodie. London: Wyman & Sons, 1882. 100-106.